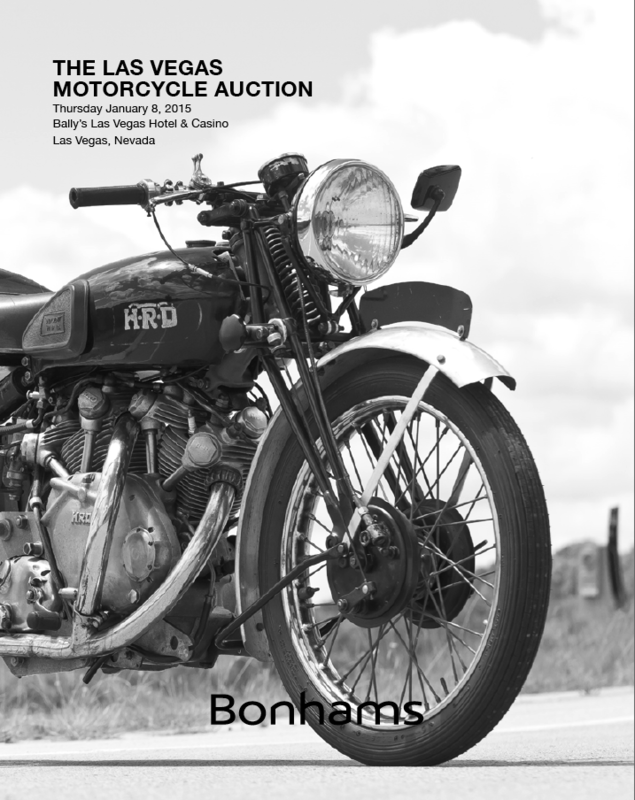 It’s that time of the year, the first 2015 from Bonham’s, this time in Las Vegas 8th January 2015, which for any grown kid with a love for heritage motorcycles is the biggest candy store of all time. Often with prices so high it is an insight into what the multi-millionaries of the world like to do with their small petty cash. As ever there is a wide range of quality Indians, Harley’s including Dirt trackers and other American makes but like always there is a very strong showing of quality British Classic hardware especially from Triumph but including Vincent, Brough, AJS and Matchless. 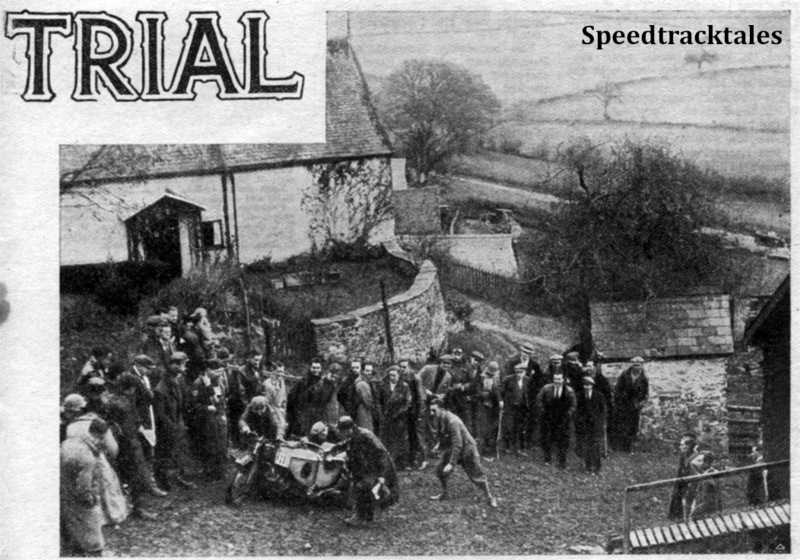 The mission of SpeedTrackTales is not just to capture as a record the history of the people the bikes and places of the International Six Days Trial. It is also important we learn of, and reflect on the social and cultural conditions of those times that contributed to both the development of the sport of Reliability Trials and its evolution to be renamed Enduro as well as the history of land access and the impact of the modernisation of highways and land management during the era. In many cases the sports happily co-existed with local people going about their own daily business. The road twists and turns all over the place, and it seemed to be full of country folk shepherding home animals from Corwen market. Early on Wednesday morning we were skirting Bala Lake and heading for Hirnant Pass, en route for Lake Vyrnwy. The lane we traversed were shockingly surfaced. It was an endless procession of large culverts, cart ruts, slimy mud, rocks and everything else imaginable. 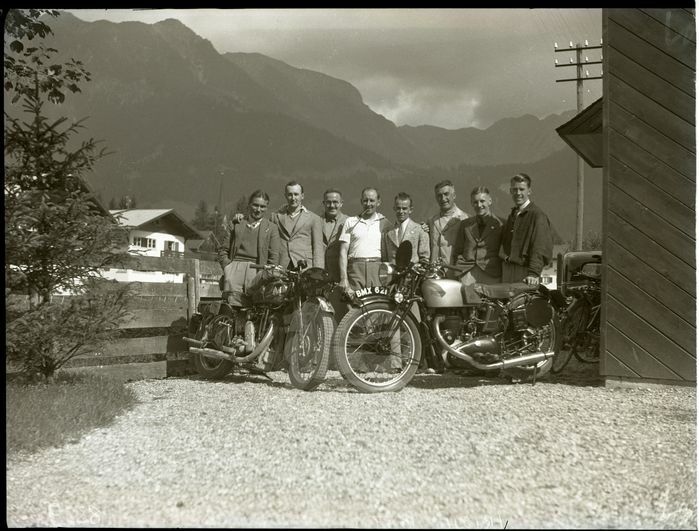 It is clear that by 1934 the area was very familiar to many in the Motorcycle industry as a place to both test Motorcycles and to undertake adventure tours by motorbike. It goes without saying to do this motorbikes were required to be reliable and handle well where road surface conditions were still poor. Places like the Bwlch y Groes, Eunant Pass and the Allt y Badi regularly feature in both test articles and event reports. Long, gruelling climbs made no difference, either. Taking the Eunant Pass from Lake Vyrnwy,” we climbed another 1,000feet, which brought us out near the top of the famous Bwlch-y-Groes. The article, coincided with the holding of the annual ‘Reliance Trial’ in the North East Wales area, the report for this event can be found here. I have been slowly sifting through the images found over xmas on the Stilltime Collection website having built a database so I can collect all the details the images allow and then linking those facts to information we hold across the site on the people bikes and places. 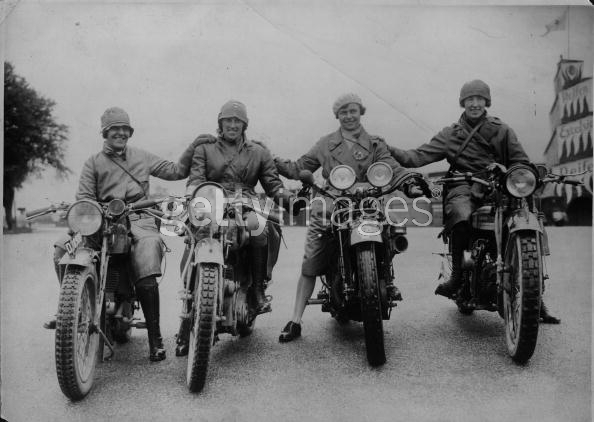 The image below of a group of men taken around two of their motorbikes including a Matchless and Triumph with a UK Vehicle Registration MX 621 makes it is likely these are part of the British contingent at the event and has been identified as being taken at the ISDT 1935.
link to image at stilltimecollection.co.uk Obviously all dedicated British ISDT enthusiasts and if anyone can help identify any of the persons in the photo we would be so grateful. I am very grateful to the great granddaughter of RC Yeates, Jessica Fraser who helped with the identification of the rider and the bike’s owner. RC Yeates rode under a Motorcycle Union of Ireland license for Ireland on a Triumph 495. His race number was #223. Although loosing only 2 points on day 1 and 1 on day 3, Robert retired at the end of day 4 despite loosing no points that day. Robert appeared for the Irish Vase team in the Welsh based events of the ISDT 1937 and ISDT 1938 where further images can be found of him. I am in particular keen to ensure the history of Welsh based Reliability Trials such as the Liverpool MC organised ‘Reliance Trial’ survives as a public record. These events were often the means by how the going for the ISDT was discovered and brought together the skilled teams of route markers and travelling marshalls. 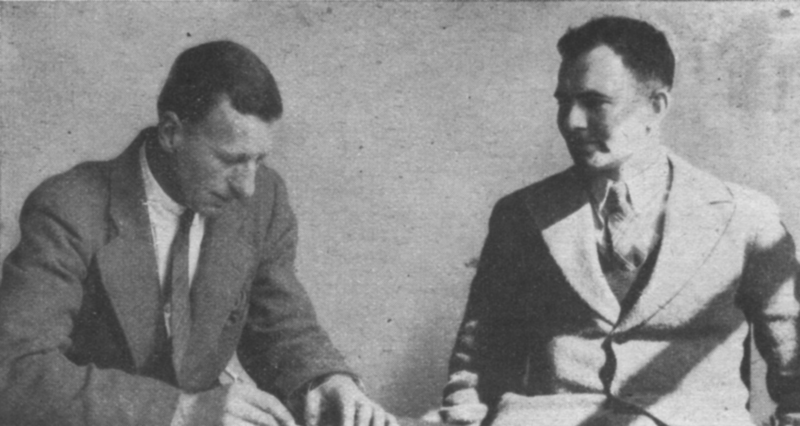 During May I will be featuring in the STT Blog full original magazine reports on both the 1934 ((to come) and the 1935 (here) edition of the Reliance Trial, as well as a number of articles written from the period about the development of both branches of the trials sport. 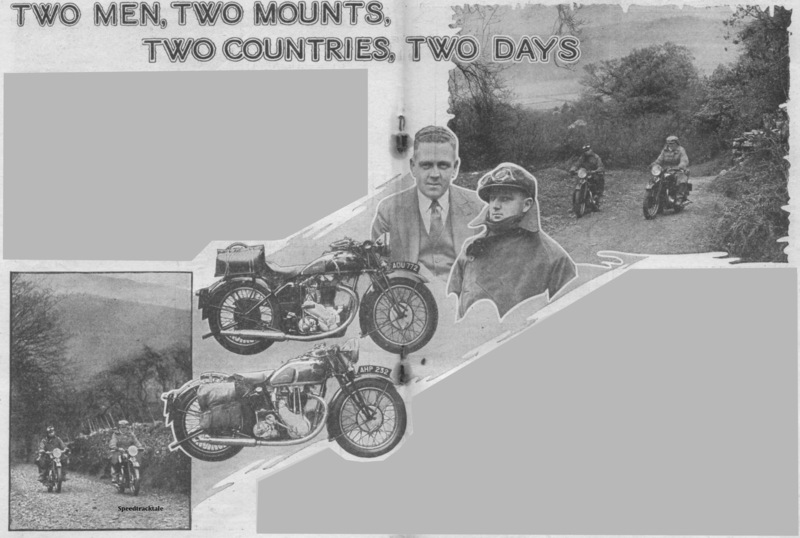 This will also include a long forgotten road test of the 1934 Model 5/5 500cc ohv and Model 6/1 Twin ohv Triumphs which was undertaken over much of the North Wales section of the ISDT 1933 route including Allt y Badi, Hirnant, Eunant Pass and the Bwlch y Groes and other classic mountain roads of the time which can be read here. The winner of the 1934 Reliance Cup was none less than ISDT stalwart George Rowley riding a 560cc AJS, with the BSA team of Perrigo, Povey and Ashworth picking up the team award. The pages connected to the ISDT 1964 produce heavy traffic for the site. Never more so in Hollywood did an actor maintain a loyal fanatical following as Steve. Not because he was particularly cookie or that his Shakespearean appearances were milestones. Its because for all the hype most stars get nobody knows who the heck they are off set. They lock themselves away at night in Beverley Hills and do what? we don’t know but Steve… he was a racer he raced anything if it had a motor, he collected it if it had a motor, he hung out with guys who dug motors. Steve was a Petrolhead and so much so he allowed his passion for motors flow into his work. The passion he had for his stuff makes his films stand out. It’s a bizzare coincidence that his birthday falls within a day of the anniversary of the break out in the real great escape, the film he piloted one of his beloved Triumphs to do many of his own stunts in the film not just relying on the great Bud Ekins to do his stunts and one of his hallmark pieces. With all the hoopla of Xmas, New Year and the acquisition of Jim Alves’s ISDT Gold Medal from 1953 I somewhat overshot publishing an article I had planned for 2nd January because it was the day after New Years Day in 1916 in Glastonbury that saw the arrival into the world of Percival Harold Alves. Jim Alves’s 1953 Gold Medal saved from anonymity. 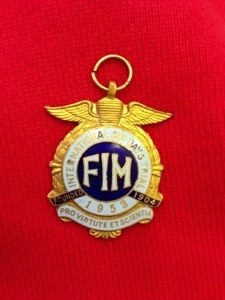 A lucky Google search in 2012 identified friends of the late Jim Alves were selling off a number of his ISDT souvenirs. 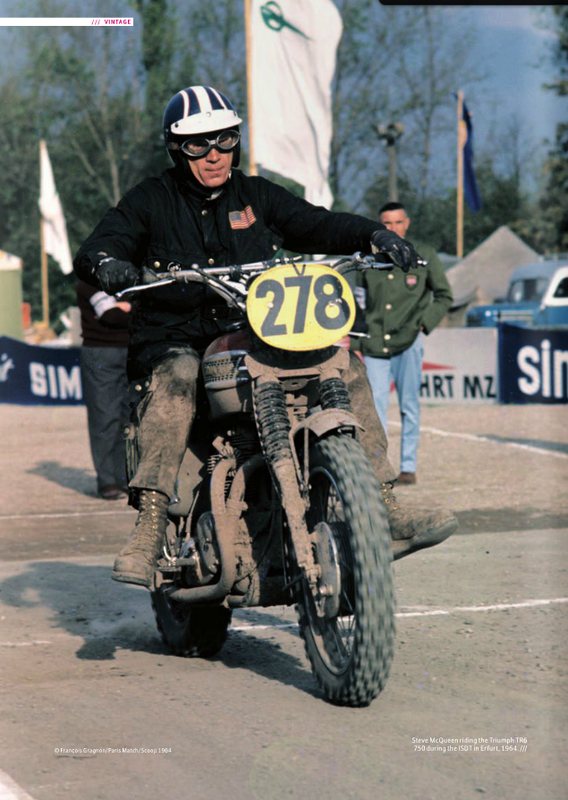 Photos of a number of these can be found on this blog but of particular interest was the FIM Gold Medal Jim won at the ISDT in 1953. For now the 1953 we had never had it so good and this was our last best win of the ISDT, with the team now gone this is an important piece of the tale of the legend they left. After brief negotiations the vendors were very keen to ensure the medal remained connected to the ISDT and agreement was quickly made for its acquisition by Speedtracktales. The collection grows. 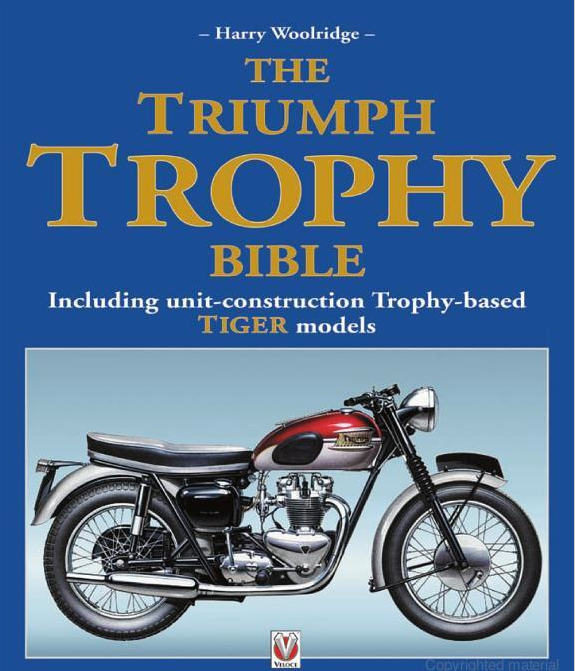 An excellent book publiched by Veloce books written with great personal authority by Harry Woolridge who knew the bike thoroughly working in the development of the bike at the Triumph works at Meridan right through an into the Workers Cooperative years. The bike was one of the mainstay items in the British arsenal of motorcycles which it used to dominate the pre 1970 ISDT and just about every detail there is to know is faithfully recorded in this book. JAC 564 TR5 1949 ???? JAC 565 TR5 1949 ???? JAC 566 TR5 1949 ???? KAC 677 TR5 1950 ???? KAC 678 TR5 1950 ???? KAC 679 TR5 1950 ???? LNX 341 TR5 1951 ???? LNX 351 TR5 1951 ???? LNX 361 TR5 1951 650cc 6T engine fitted ???? MNX 62 TR5 1952 ???? MNX 64 TR5 1952 ???? NUE 813 TR5 1953 ???? NUE 814 TR5 1953 Rigid converted to Swing Arm ???? NUE 815 TR5 1953 ???? NWD 198 TR5 1953 650cc 6T engine fitted ???? NWD 199 TR5 1953 650cc 6T engine fitted ???? PNX 388 TR5 1954 650cc 6T engine fitted ???? PNX 660 TR5 1954 ???? PNX 661 TR5 1954 ???? PUE 727 TR5 1954 ???? PUE 728 TR5 1954 ???? SAC 980 TR5 1955 ???? SAC 981 TR5 1955 ???? SAC 982 TR5 1955 ???? HAC 373 TR5 1956 ???? HAC 374 TR5 1956 ???? HAC 375 TR5 1956 ???? YNX 962 TR6 1958 ???? YNX 963 TR6 1958 ???? RWD 853 TR6 1958 ???? 608 BWD TR6 1960 ???? 777 BWD TR6 1961 ???? 119 CAC TR5AC 1961 ???? 120 CAC TR5AC 1961 ???? 230 CAC TR5AC 1961 ???? 105 CWD T100C 1962 350cc engine fitted ???? 106 CWD T100C 1962 ???? 895 BUE TR6 1962 Built for Bud Ekins ???? 929 FNX TR6 1962 ???? 678 CUE T100C 1962 ???? 117 LAC TR6 1964 ???? BNX 822B TR6 1964 Built for Steve McQueen ???? HUE 252D T100C 1965 350cc engine fitted ???? HUE 253D T100C 1965 ???? HUE 254D T100C 1965 350cc engine fitted ???? HUE 255D T100C 1965 Enlarged 504cc engine ???? HUE 256D T100C 1965 Enlarged 504cc engine ???? The image of motorcycle racing is often defined in popular culture by the vision of men motors and leather. There should, however, be no doubt throughout the history of motorcycle sport, which predominantly post dates the era defined by Women’s campaigns for the right to vote and the germination of the principles of equality the ACU banned their taking part in road racing in 1925. 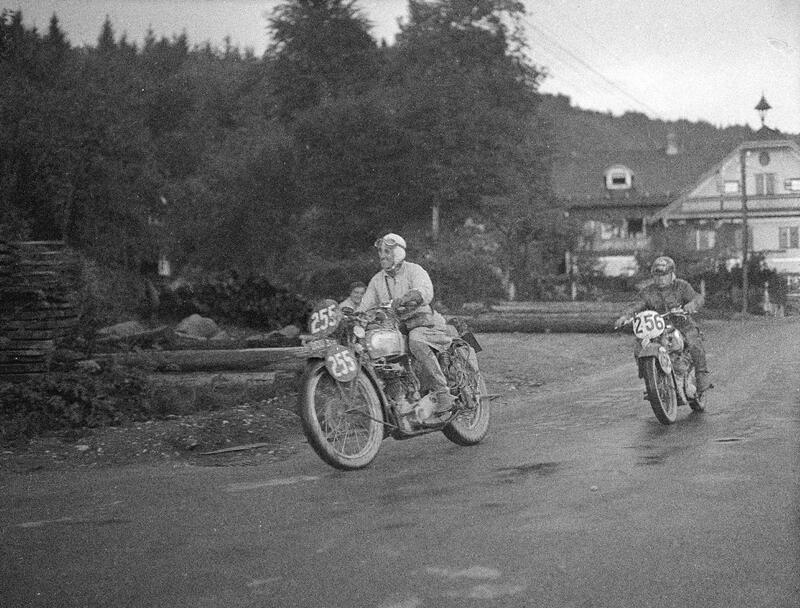 Women although few in number instead became active and competitive entrants in off road motorcycle racing Cottle and Edyth Foley both winning Gold Medals in the ISDT in 1925.